Sophia Charlotte, daughter of the Duke of Mecklenburgh-Strelitz, married the young King George III in 1761. At the time of this portrait she was 21 or 22 and already the mother of four children. Seated on a needlework chair, she is dressed in silk, silver and lace. 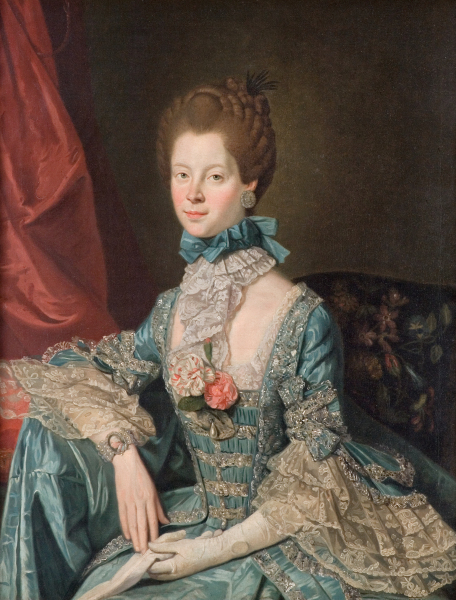 Her hair is tightly dressed in the French style and her outfit is completed with a pair of camellias. She has removed her glove to reveal a pearl bracelet with a miniature of her husband.